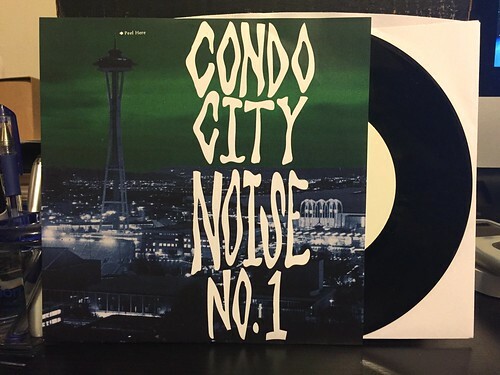 I Buy Way Too Many Records Dot Com: V/A - Condo City Noise 7"
Five-Five Hole sent me this record to review a little bit ago (no, I haven't been sitting on it since 2014, but I have had it a few months), but I've been slacking on getting it written up. I'm not sure what it is about compilations, but I tend to drag my feet on them. I think it's because you end up writing multiple mini reviews instead of one larger one. Condo City Noise No. 1 boasts four bands in total from the Puget Sound area in Washington State, three of which fronted by female vocalists. First up on side A is NighTrain, who I hope were named after the Public Enemy song, but that's probably not the case. This is a slow burn of a song, built on a pounding drum beat, creepy organ and stormy vocals. Tons of tension bubbling under the surface of this one. Next up is Wild Berries, who take a more traditional rock and roll approach to their contribution. A nice chugging guitar riff lays the foundations for another strong vocalist who reminds me of the more soulful moments of The Ballantynes. Flipping over to side B we've got Acapulco Lips. Theirs is probably the poppiest song of the bunch and no surprise it's also my favorite. A bouncy lead guitar riff leads you through the verse into a loud punchy chorus, with "ba ba ba ba ba" backing vocals that really seal the deal for me. Closing things out is Killer Ghost, the one band fronted by a dude on this 7". It's a solid song with vaguely surfy guitar licks and some nice "whoas" as backing vocals in the chorus. It's a good closer, probably my second favorite song of the bunch.